Nord Beat, Virtual instrument for iPhone / iPod Touch / iPad from Clavia. 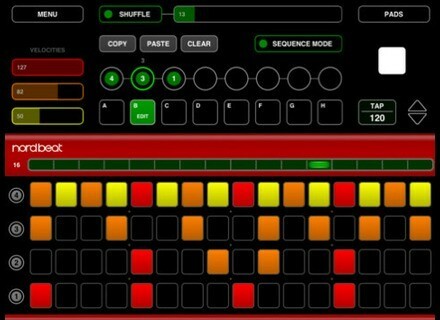 Nord Beat is a 4-track CoreMIDI Step Sequencer for iPad. It can accompany your Nord Drum and is available for free at the App Store. Nord Beat lets you create drum beats in classic 16 step grid with up to 8 patterns. Patterns can be played back in two ways: In Sequence Mode, up to 8 patterns can be cued and will play in a chained fashion. Each pattern can be set to repeat up to 8 times to create a song progression. When Sequence Mode is turned off, a single pattern will loop until you cue another. Any pattern can be edited while playing and the Copy/Paste function lets you create variations over a pattern. There are 3 velocity levels represented by colors, and are changed by swiping up or down on the desired notes. The actual velocity values can be altered with the velocity faders for changing accents and dynamics in real-time. The Shuffle amount can also be changed on the fly and each of the 4 tracks can be muted individually. The Pattern length can be shortened (1-16) while playing for creating breakdowns or alternative time signatures. Nord Beat also features a Pad Mode that lets you play the Nord Drum (or other MIDI gear) with your fingers and gives you control over the velocity. The center zones transmit full velocity and gradually gets lower towards the edges. 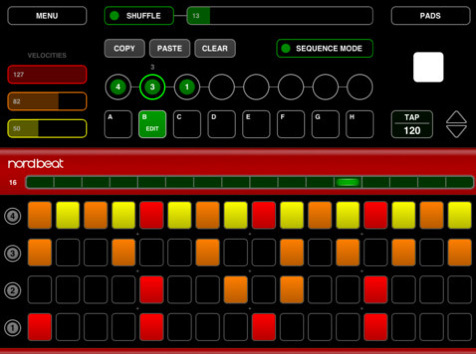 The pads can be used simultaneously with the sequencer. Although designed with the Nord Drum in mind, Nord Beat can be used with any MIDI instrument. A CoreMIDI compatible MIDI interface is required. Visit the Appstore or the Nord Keyboards website for more details. Zplane vielklang instant harmony v2.0 Beta zplane has announced that the upcoming version 2.0 of vielklang instant harmony is now available as a public beta version. Tek'it Audio Genobazz v2.2 Tek'it Audio has announced the updates of Genobazz their free bass synthesizer plug-in to version 2.2 and the release of a free expansion. Steinberg Padshop Pro & Retrologue Trial Versions Steinberg released trial copies of their latest soft synthesizers, Padshop Pro and Retrologue.